The lens at the front of your eye focuses light onto your retina, the thin nerve layer at the back of the eye that transmits images via the optic nerve to your brain. The macula, located in the center of the retina, is the portion of the eye responsible for your fine, detailed vision. The optic disc is where the retinal nerve fibers come together and exit the back of the eye. A non-invasive process called Optical Coherence Tomography (OCT) can be used to analyze your macula, optic disc, and nerve fiber layer. 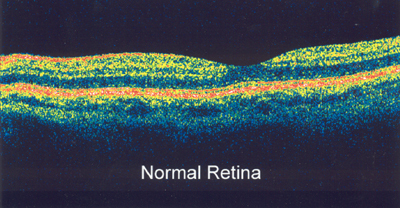 Through OCT, your doctor is able to see an image of the 10 layers that make up your retina. This process is similar to a CT scan, and it allows the thickness of each layer to be measured. It can be used to confirm a specific retinal diagnosis, such as a macular hole, as well as to track progressive retinal diseases such as age-related macular degeneration (AMD). OCT also can measure the surface contour of the optic nerve, along with the thickness of the surrounding nerve fiber layer. The results are compared to a normal database, as well as to any previous tests you’ve had. The results of one eye are also compared to the opposite eye, as asymmetry in the individual eyes may be a sign of early glaucoma. This process can detect changes to the optic disc or nerve fiber layer. If you are diagnosed with AMD, glaucoma, or other progressive diseases, such as diabetic retinopathy, your doctor will compare your first or baseline OCT with future tests to monitor the progression of your disease over time. OCT testing takes approximately five to seven minutes per eye and is painless. Since your eyes will be dilated for this test, we recommend that you have someone drive you to this appointment. Optical Coherence Tomography is done at our Plymouth Office only.